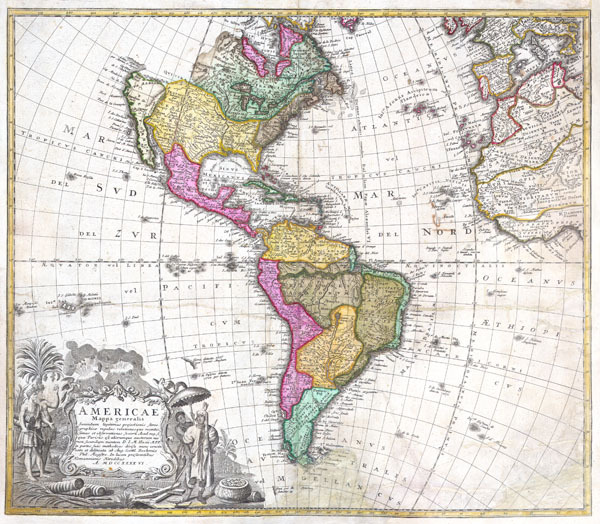 A stunning 1746 Homann Heirs hand colored map of both North and South America. This is the second issue of this important map following the earlier edition by J. B. Homann. Map reflects a considerable advancement in American cartography of the time as well as a general increase in knowledge regarding America's interior from explorations and colonizations. Map immediately precedes the French and Indian War, so the French are shown to dominate North American while the Spanish are preeminent in the south. The Pacific Northwest is largely unexplored, but nonetheless, the mythical Northwest Passage is shown. As is the mythical Quivira, 'Land of Gold and Silver,' sought after by conquistador Francisco de Coronado in 1541. The beautiful decorative title cartouche in the lower left quadrant depicts two erupting volcanoes and several American Indians, one of which is seems to be holding aloft a shrunken head or similar idol. An important early map of the Americas. Good condition. Fill repair bottom center.